The Preserve America Youth Summit, a program of Conservation Legacy, provides engaging on-site interactive learning experiences for students, teachers, and service leaders at historic places. The Summits engage in local history, historic preservation, cultural conservation, and heritage tourism issues to foster leadership and strengthen community efforts. Next Generation Stewards is a four-day program for Colorado middle and high school students, teachers, and service leaders, in the Black Canyon of the Gunnison National Park, and Curecanti National Recreation Area, Ute Indian Museum, and Montrose Area. 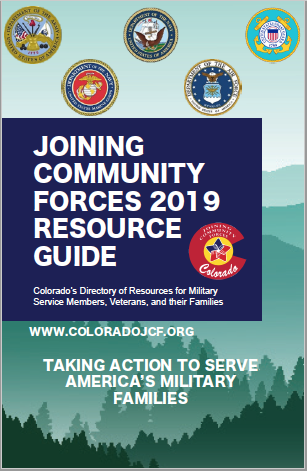 Participants selected through a competitive application process are offered both community service hours and full scholarships for all program costs, including meals, transportation, and lodging. 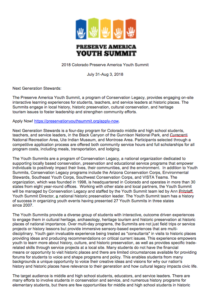 For more information contact Jessika Buell at youthsummits@conservationlegacy.org or visit https://preservationyouthsummit.org.